"The recent UNC scientific study confirms years of our clinical experience." says Dr. William Mullins at the Center for Rheumatic Diseases and Osteoporosis in Bethesda, Maryland. "Chi Running is a unique running style that causes less stress for lower extremity joints and supporting structures than any other running technique. Chi Running reduces the risk of running injuries, and increases the chance that we can continue running into our 80s. I routinely recommend the ChiRunning workshops or DVDs for my patients who run for exercise." (1) Experienced the least amount of impact. (2) Experienced a smoother landing without the jarring most commonly attributed to heel striking. (3) Landed closer to their center of gravity. (4) Showed the least amount of Maximum Braking Force upon impact with the ground. TSR – Runners with a rearfoot strike and wearing traditional running shoes. MSR – Runners with a rearfoot strike and wearing minimalist shoes. MSA – Runners with an anterior (forefoot) strike and wearing minimalist shoes. CHI – Runners in this group were proficient in the Chi Running technique with a midfoot (full-foot) landing in both traditional and minimalist shoes. Click Here to go to the ChiLiving website for more details on the 1-year study at University of North Carolina at Chapel Hill, USA. 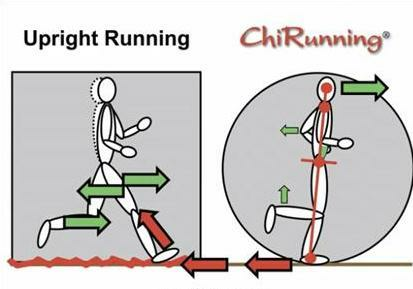 The following image by fellow ChiRunning Certified Instructor David Stretanski illustrates the difference between upright or what I call power running (as you need to use the power of your muscles to propel the body forward) versus ChiRunning which uses a controlled forward lean from the ankles to engage gravity which pulls the body forward, allowing the legs to remain to the rear co-operating with the force of the oncoming road. Thanks to David for making it clearly visible and easy to distinguish the difference between the two. Which way are you running? Now which way would you like to run? Click here for upcoming ChiRunning workshops. Going central.....well a little bit more central Cork than before as regrettably St Dominics is closed for the moment pending plans. So we're off to the Mardyke area right beside Fitzgeralds Park to Cork County Cricket Club where they've a nice room for the indoor activities and then we've Fitzgerald Park and the Lee area for plenty of ChiRunning and ChiWalking. Dates for 2013 are booking up pretty fast so don't be disappointed, click here.